What a year! Time really does fly by when you’re having fun. We have so many great memories from 2017 and we thought we would count down our seven favorite things from the past year. WinStar World Casino and Resort is always looking for ways to improve guests’ experiences, and adding new, delicious restaurants is one of our favorite things. Kirby’s Prime Steakhouse & Mickey Mantle’s and IHOP Express opened in 2017 giving guests new dining options to choose from during their stay. In February, Whitney came on board as our awesome blog contributor. From fashion to travel, entertainment to celebrations, Whitney is our go-to girl for inspiration. The Lightning Link Lounge powered by Casino 360 opened in September 2017. The atmosphere at the Lightning Link Lounge can’t be beat and the pulsating lights, upbeat sounds and music will keep you on the edge of your seat. This area has 150 Lightning Link games, making it home to the largest bank in the world. WinStar had a fiesta during Hispanic Heritage Week with thrilling entertainment every night. There were performances from four-time Grammy Award and Latin Grammy Award Winner, Pepe Aguilar, and pop superstar and previous judge on The X Factor, Paulina Rubio. This was our biggest Lunar New Year celebration yet! We had fantastic entertainment and performances all week long. Summer brought a number of fun experiences including Weekends After Dark and events at The Colosseum at WinStar with Steven Tyler & the Loving Mary Band, Keith Urban and PBR. The Colosseum is our outdoor venue that holds almost 10,000 people and is the prime location to enjoy your favorite shows with your family and friends. We closed out the summer at WinStar Golf Club with the best long drivers around at the Volvik World Long Drive Championship. WinStar hit a major milestone in 2017! Employees came out in full force to participate in OBI blood drives at WinStar throughout the year. WinStar met its goal to donate more than 1,000 units in 2017! Serving our community together this year was so rewarding and we are so grateful to have such generous employees. 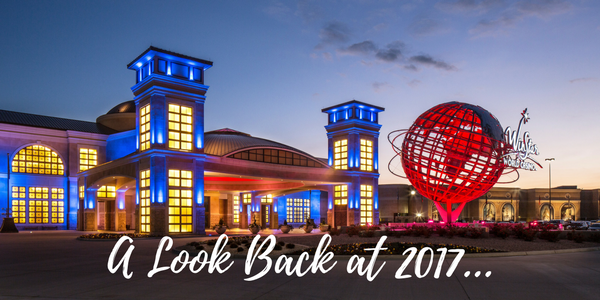 Share your favorite WinStar 2017 moments with us on Facebook, Twitter or Instagram! Thanks for being a part of this fantastic year! We’ve loved every minute of it, and we can’t wait for the good times to keep on rolling in 2018!